THE FIRST EVER GRAPHIC NOVEL NOMINATED FOR THE MAN BOOKER PRIZE A NEW YORK TIMES NOTABLE BOOK ON 20 BEST OF 2018 LISTS INCLUDING THE WASHINGTON POST, NPR, NEWSWEEK, AND THE GUARDIAN "Sabrina is the intimate story of one man's suffering, but it also captures the political nihilism of the social-media era--a time when a President can dismiss the murder of a journalist by saying of the perpetrator, "Maybe he did. Maybe he didn't."" --DT Max, The New YorkerConspiracy theories, breakdown, murder: Everything's gonna be all right--until it isn'tWhen Sabrina disappears, an airman in the U.S. Air Force is drawn into a web of suppositions, wild theories, and outright lies. He reports to work every night in a bare, sterile fortress that serves as no protection from a situation that threatens the sanity of Teddy, his childhood friend and the boyfriend of the missing woman. Sabrina's grieving sister, Sandra, struggles to fill her days as she waits in purgatory. After a videotape surfaces, we see devastation through a cinematic lens, as true tragedy is distorted when fringe thinkers and conspiracy theorists begin to interpret events to fit their own narratives.The follow-up to Nick Drnaso's Beverly, winner of the Los Angeles Times Book Prize, Sabrina depicts a modern world devoid of personal interaction and responsibility, where relationships are stripped of intimacy through glowing computer screens. Presenting an indictment of our modern state, Drnaso contemplates the dangers of a fake-news climate. Timely and articulate, Sabrina leaves you gutted, searching for meaning in the aftermath of disaster. 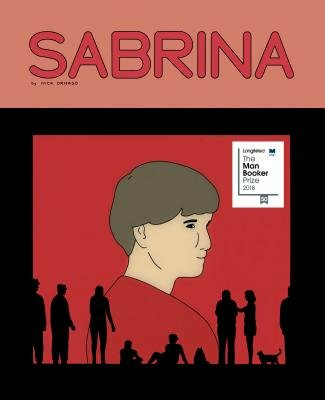 ...[an] absorbing graphic novel about grief, depression and the Information Age.... Sabrina is drawn in a smooth ligne claire style with simple human figures and lush backgrounds digitally colored in pastel hues. Mr. Drnaso restricts himself to a conservative comic strip format (square frames of varying size), and yet he is a master at modulating the intensity of light and has a draftsman's knowledge of 21st-century architecture. Like any fine novelist, he is unafraid to confront us with the terrible facts of how people really live.... The only disappointment is the last few pages, which come cheap and relatively happy, a resolution unearned by the mounting horror that precedes it. In his eerie and astute second graphic novel, Sabrina, Nick Drnaso delivers a vivid panorama of the muddled minds and misanthropic deeds of those who choose to fall under a conspiracy theory's thrall.... Drnaso's simple, rigid drawings capture the bleak blankness of much contemporary life, anomie hovering over almost every interaction, both real and virtual. His muffled colors build the texture of a world bombarded with distraction yet void of connection, and his careful use of boxes and frames conveys the stunning lack of freedom the supposedly free space of the internet constructs, a dim and inert prison of both the body and the spirit.... Drnaso's book leaves the audience holding its breath, hoping his flawed but sympathetic characters will find their way from lies to truth.